SSE Hire and US-based Sound Image have co-supplied the 2018 Imagine Dragons European Tour, the latest venture for the United Audio Companies collaboration. Following on from the release of their third studio album Evolve in 2017, US band Imagine Dragons kicked off an extensive world tour, with the North American leg in Autumn 2017. At the turn of the year, the tour reached South East Asia, before arriving in Europe at the start of February. The band are established clients of California audio company Sound Image. In 2015 SSE Audio and Sound Image set up a working partnership dubbed United Audio Companies, designed to enable both firms to improve the international support they can offer to their clients on both sides of the Atlantic. For the European leg of the tour SSE Hire supplied the control and monitors package, while Sound Image shipped an Adamson E-Series line array package across the Atlantic. For the tour the Adamson system had main L-R hangs of eighteen Adamson E15s with side hangs comprising nine E15s with six E12 underhangs. Twelve Adamson E219 Subs were flown behind each main hang and a further six per side were ground stacked left and right. Two rear hangs of twelve S10 provided the coverage for the outer extremes of the arena. All amplification was Lab Grruppen PLM20000Q. The Adamson system, along with the Lab Gruppen amplifiers, was shipped direct to SSE Audio Group’s Redditch HQ, where the amplifiers were repackaged into SSE’s touring racks. For monitor duties, Jared Swetnam opted for an Avid VENUE S6L. The band members all used In Ear Monitors, greatly reducing the amount of onstage sound and simplifying the four numbers that took place on a B-Stage at Front of House. 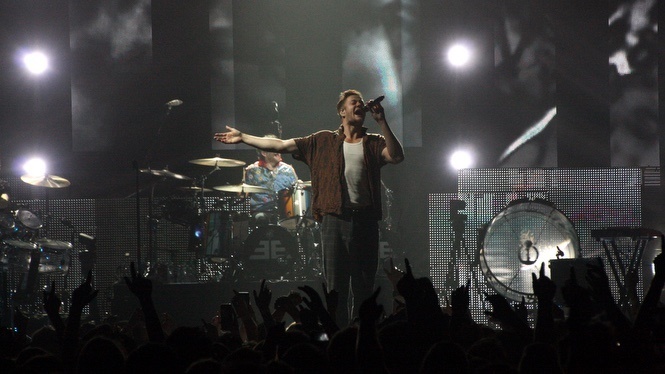 The first phase of the Imagine Dragons European tour finished in Glasgow on 4th March. From there the band head off for South America before returning in early April for further dates across Europe.